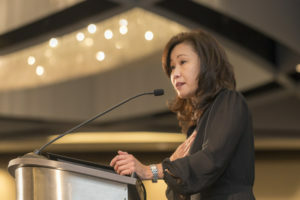 On December 18th, 2018 more than 450 members of the legal community gathered at the Hyatt Regency in San Francisco for the installation of Walkup, Melodia, Kelly & Schoenberger’s Doris Cheng as the new President of the Bar Association of San Francisco for 2019. Cheng is easily identified as a top-litigator and educator of law for many judges and lawyers who practice both nationally and internationally. Cheng’s installation speech began with giving credit to those that have been a part of her progress and growth. The Cheng family members, the Dent family, and her Walkup family. Accrediting her family and those who have believed in her along the way to her success, Cheng beautifully speaks to the “roots of progress” being with the Bar Association of San Francisco. While focused on change, Cheng spoke about the hundred years of pro bono service to the community, and in the more recent years the focus of having more women in law. She goes on to speak about her 2019 blueprint stating, “In our 2019 blueprint, BASF and JDC will launch the Woman In Trial Initiative. The program is not strictly limited to women. I know that you will all want to participate. We want to collaborate with all members of BASF and JDC, but we have a continued interest in soliciting women and also ethnic minority attorneys,” said, Cheng. Cheng is initiating two two-day trial skills courses specifically for a woman and minority lawyers. She claims that the course will follow the National Institute of Trial Advocacy (NITA) learning-by-doing model where the attorneys will receive lectures and do performance reviews paired with instant feedback. The teaching faculty will include a variety of experienced judges and trial lawyers. According to Cheng, “the first training program will be held on Friday, February 22 through Saturday, February 23, 2019. The second class is scheduled to be sometime in the summer of 2019. In exchange for her valuable insight and guidance, the Bar Association of San Francisco asks for the attorneys that participate in the training course take the time to do one pro-bono case in 2019. For more information on this course check out the news on sfbar.org and for all images taken at the event go to their Facebook page.